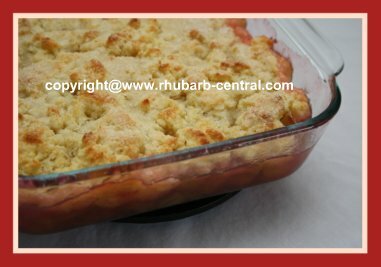 Easy Rhubarb Cobbler Recipe - Make a Homemade Cobbler for Dessert! 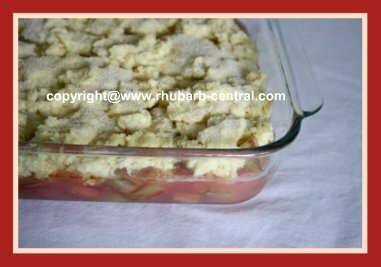 Make a Rhubarb Cobbler for Dessert! 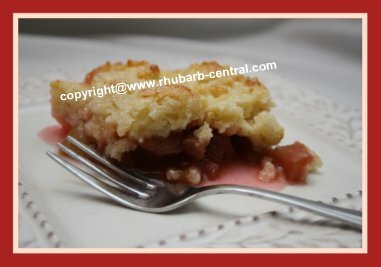 This Easy Rhubarb Cobbler Recipe makes an amazing dessert or snack time treat! I made this today with my first-of-the-year rhubarb harvest ... and ... WOW ... everyone loved it so much! You can make this dessert with frozen rhubarb too ... just thaw it the evening before, in a sieve, over a bowl, and discard the excess liquid. It certainly did not last the day! This awesome cobbler is made into an 8" or a 9" square baking dish. The taste of this cobbler dessert is so good, you and your family or guests will be happy you chose to make it! Comfort food doesn't come more yummy than this! This Homemade Rhubarb Cobbler has Fabulous Flavour! This Cobbler Recipe won't last long ... everyone will LOVE it! In a pan, uncovered, combine the sugar and the cornstarch. Stir in the chopped rhubarb and the water. Heat on medium heat to dissolve sugar and cornstarch, then bring to a boil on medium-high heat, and cook for about 2 minutes (uncovered). Stir almost constantly to avoid sticking and burning. Remove from heat, and transfer rhubarb to a 8" or a 9" square, greased, baking dish. Dot with butter, and sprinkle with the cinnamon. In a medium bowl, whisk together the flour, sugar, baking powder and the salt. In a small bowl, using a fork, beat the egg, and then mix in the milk. Add the egg mixture to the dry ingredients, stirring just until moistened. Drop by spoonfuls on top of the rhubarb mixture in the baking dish. (batter will be wet). Sprinkle the batter with the sugar. Bake at 400° F for about 20 minutes, or until crisp and browned. 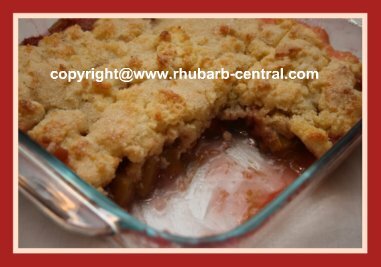 Enjoy this Easy Rhubarb Cobbler Recipe! Out of Oven! ... Scrumptiously Scrumptious! How to you store your flour to keep it fresh?